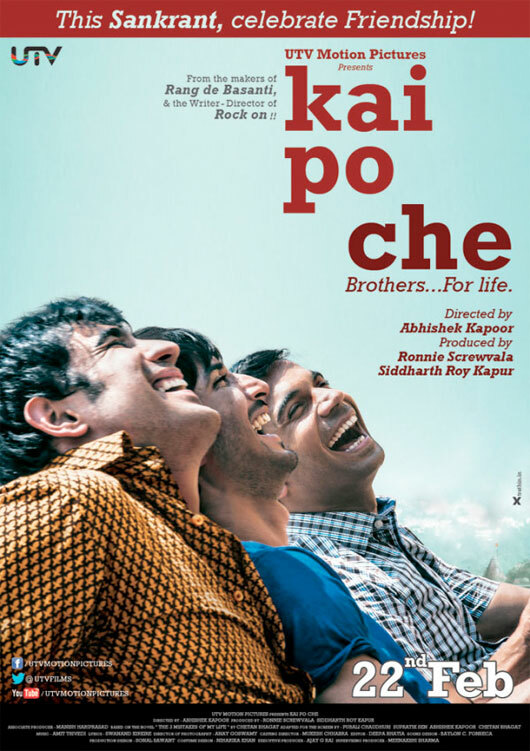 I saw the honest, deceptively simple and thoroughly engaging Kaipoche last week. The film has apparently opened well at the box-office. It’s producers UTV seem to have backed a film without stars and without ‘safe’ ingredients to the hilt. Kaipoche is a triumph of conviction and a celebration of audacity. I believe this is the time. A time for the mavericks to shine. A time for the mad to blossom. A time for the honest to express. A time for the artist to create. A time for the fearless. A time for audacity. Ever since I made Shahid I’ve been asked over and over again about how the trend of biopics is on the increase. The media unfortunately reads trends very poorly and looks for convenient analysis. Trade pundits who have in the past thrived upon silly generalization are very shallow in their understanding of artistic/creative decisions taken by film-makers or in analyzing the success of films that don’t fall into their formulaic comfort zones. The truth is that book adaptations, biopics and stories inspired by true events are an indicator and not trends in themselves. We now have film-makers looking for newer stories to tell. We have film-makers looking for new ways to tell stories. We have film-makers who are fearless. We have film-makers who are not afraid of audacity. Whether it is Talaash, Gangs of Wasseypur, Ek Main aur Ek Tu, Vicky Donor, Special 26 or Kaipoche I notice a fearless streak in the directors and the team that has made these films possible. Even potboilers like Dabbang or before that Wanted or the recently released ABCD have displayed a certain audacious vision. Rockstar had the audacity to be deeply philosophical and sometimes meandering while pretending to have commercial trappings. A certain Anurag Kashyap whose films either got banned or termed as jinxed is now celebrated because of his delightfully indulgent Gangs of Wasseypur or his subversive take on Devdas. Sujoy Ghosh redeemed himself with the surprising Kahaani. Tigmanshu Dhulia’s Pan Singh Tomar was commercially successful. English Vinglish marked the successful return of a Bollywood diva who churned out some of the most cringe-worthy films of my growing up years. Tanu weds Manu with it’s unconventional cast, relaxed pace and fresh music created a new benchmark for the romantic genre. The list could be exhaustive and I’m sure it will soon dominate successful box-office lists. On the other hand there has been a steady increase in films (Ship of Theseus, Miss Lovely, Peddlers etc.) that have found appreciative audiences in international film festivals and critics. These films have shown a fierce independence in their making while giving alternate Indian cinema a new lease of life and an unpretentious, fresh form of expression. They have been audacious in their abandonment of what we perceived as ‘art-house’ or ‘parallel’ cinema in India. They were unabashed in their treatment, style, narratives and expression. These and many other films that I have viewed over the past year and this year have challenged audiences, provoked critics and subverted formulaic convention with amazing audacity. Even more encouraging is the fact that producers, actors (including some stars) and trade have begun to embrace the audacious breed, backing them to the hilt. So what is the point I’m trying to make? It’s simple. Audacity is in. Safe is not safe anymore. Take the second installment of Dabbang. It disappointed because it succumbed to ‘ingredientization’ and failed to live up to the fearless audacity of the first part. Films like ‘Zilla Ghaziabad’ or ‘Jayantabhai Ki Love Story’ are passé. They will continue to get made. They will continue to remind us of everything that is unimaginative and about how we have allowed ourselves to be taken for granted all these years. So here is my two bit gyaan. Whether you aim for the mainstream or the alternate space, make it audacious. Just making it big will soon cease to work – neither for the makers or the audience. Yes we will have regular installments of successful franchises. We will have ridiculous remakes. We will have mindless, storyless films – but my guess is that all of them will work for their audacity and not for their adherence to convention. “My wife is not in the mood”. Are they ever? Next Next post: Lamb Chops Masala – Without a drop of oil!